A few nights ago, I had dinner at my cousin Elena’s house in Milan. She is the sweetest, most gorgeous girl, but, notoriously, she can’t cook to save her life! Lucky for all the guests, she also invited her bother Giorgio along, who was born with the cooking gene. Giorgio has always been a flamboyant wine connoisseur and a passionate amateur cook and has certain savoir-faire in the kitchen, it always is a pleasure for me to watch him at work and exchange tips and recipes. That night he made Italy’s most loved summer classic, Spaghetti con Pomodorini (with fresh cherry tomatoes), with a little twist. He cooked the pasta “risotto style”: forget about boiling, draining and then dressing the pasta with your sauce! When you do it “risotto-style”, the spaghetti cooks in a rich and velvety fresh tomato liquor, slowly absorbing all the flavors, while the starch released by the gentle and constant stirring motion creates a luscious sauce. 1. Heat up the oil in a heavy-based frying pan or large saucepan. Stir fry the shallots and garlic over medium-low heat, for 1-2 minutes or until the onion is soft and the garlic smells fragrant. Add the tinned tomatoes or passata, season with salt, bring to a simmer, then turn the heat to low. 2. Cook the sauce for 20 minutes. 3. Bring a large pot of salted water to the boil. Cook th spaghetti in it for 1-2 minutes or until the pasta has softened. Using kitchen tongs, lift the spaghetti straight into the tomato saucepan. Cover with enough pasta cooking water so that all the pasta is submerged with liquid. Stirring gently, continue cooking until the pasta is Al Dente and the liquid has been absorbed and you are left with thick, rich sauce. This will take 5-7 minutes, according to the size of spaghetti you use. When the pasta is al dente, add the cherry tomatoes and basil leaves. Turn the heat off. Taste for salt and adjust accordingly. 4. Serve hot, with a generous dusting of parmigiano and plenty of bread to mop up that delicious sauce. beautiful.. I will try this tonight Silvia as i have a housefulof cherry tomatoes and plenty of fresh tomato sauce ready, thanks to my garden! When are you headed back to Sidney? Smiles, from Tupelo, MS. Thanks Barbara! Did you try it? You can cook spaghetti this way with any sauce that has a bit of liquid. I’m going back to Sydney in 4 weeks or so.. Don’t want to, though!! Hi Silvia! I make one very similar to yours, which is originally my grandmother’s recipe but with chopped tin tomatoes instead. Looks good. Will try this dish soon. Hope your having a great time time in Italy. Love your blog, both the English and Italian versions. I heard you were keen to do a book. Would love to talk to you about it. Please contact me if you’re interested. I will reply to the email address you provided. wow wow wow im making this!!! This dish looks delicious and it’s so pretty! I’m going to try it. I have a client who loves spaghetti, and I love Risotto. what could be bad? this is the best of both worlds! Caroline, I’m so glad you and your husband enjoyed this! Silvi – I have completely adopted this recipe… I call it Spaghetotto! So yum! 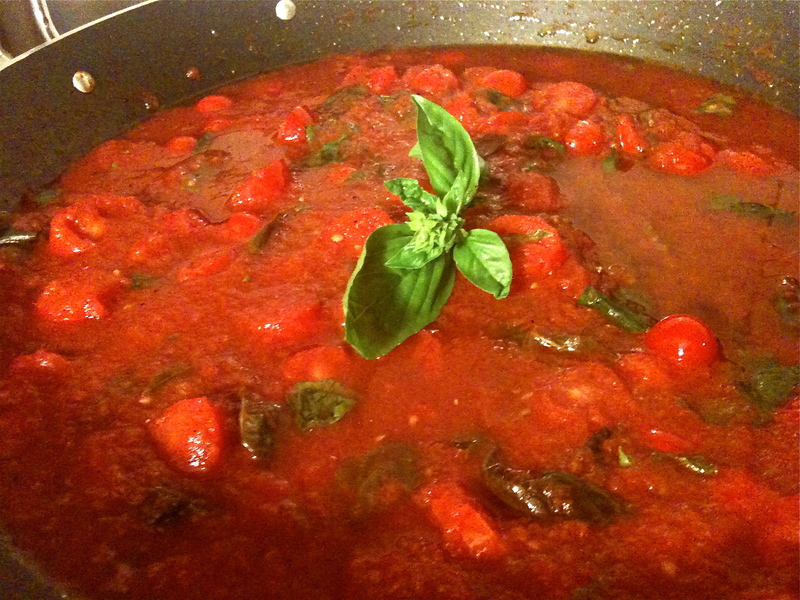 The passata worked out ok too – a bit thin, but not bad for my first try! Great name for it, we eat this regularly too! Oh please, let me know how you go! I am thinking this is dinner tonight. Looks incredible!